Ananth Kumar funeral HIGHLIGHTS: The mortal remains of Kumar were taken to Jagannath Bhavan, BJP state office at Malleshwaram, where arrangements were made for party workers and his followers to pay their last respects. The last rites of Union Parliamentary Affairs Minister and senior BJP leader Ananth Kumar, who passed away at a private hospital in Bengaluru Monday after battling lung cancer for several months, were performed at Chamarajapet crematorium around 3 pm on Tuesday. The mortal remains of Kumar were taken from his Basavanagudi residence, where it was kept since Monday morning to Jagannath Bhavan, the BJP state headquarters at Malleshwarm, in a decorated military vehicle with personnel of the three services — the Army, Navy and Air Force — accompanying it. The procession began, with supporters chanting slogans “Bharat Mata Ki Jai”, “Ananth Kumar Amar Rahe”. His body will then be taken to National College Ground in the city for the public to pay their respects. The Karnataka government Monday declared a three-day state mourning till November 14. The State government also declared a holiday on Monday as a mark of respect to Kumar. “A state funeral with 21-gun salute and guard of honour will be accorded to the mortal remains of Kumar at a crematorium in the city’s southwest suburb on Tuesday afternoon in accordance with Hindu rites,” an official said. Ananth Kumar, a Union Minister and six-time MP, died at a private hospital after battling lung cancer for several months. Kumar, 59, breathed his last around 2 am with his wife Tejaswini and two daughters by his bedside, said Sankara Hospital Director Nagaraj. He returned to Bengaluru only recently after undergoing treatment in the US and Britain. The senior BJP leader had been on a ventilator in the Intensive Care Unit for the last few days. The mortal remains of Union Parliamentary Affairs Minister Ananth Kumar were consigned to flames at the Chamarajapet crematorium with full state honours Tuesday, PTI reported. Kumar's younger brother lit the funeral pyre, performing the last rites according to Smartha Brahmin traditions, amidst chanting of Vedic hymns by priests at the Chamarajapete cremation ground. Chants of "Amar rahe, amar rahe, Ananth Kumar amar rahe" and "Bharat mata ki jai" rent the air as leaders paid homage and the mortal remains were consigned to flames. People had lined up on both sides of the roads at several places to have a final glimpse of their "most loved" Bengaluru MP, known for geniality and accessibility. Naidu, who had shared a special bond with Kumar since the ABVP days, flew in here from Delhi and drove straight to the National College ground and paid homage to his former colleague in the union ministry by placing a wreath on his mortal remains. Several BJP leaders including Union Minister Sadananada Gowda, R Ashoka, K S Eshwarappa, Anurag Thakur, Prahlad Joshi, and hundreds of party workers paid their last respects to the departed leader. Kumar's mortal remains were then taken to the National College ground, with which the six-time MP was closely associated having hosted many of his political events there. After public homage, the body was taken to the Chamarajapet crematorium, where the final rites would be performed by his brother Nanda Kumar, in the afternoon. Hundreds of mourners filed past the body of Kumar, which lay in state at his residence till this morning and was then taken to the party state headquarters 'Jagannath Bhavan' and the National College ground in his Bengaluru South parliamentary constituency. From the Basavanagudi residence, where it was kept since Monday morning, the mortal remains were carried in a decorated military vehicle with personnel of the three services- the Army, Navy and Air Force- accompanying it, amid slogans of "Bharat Mata Ki Jai" and "Ananth Kumar Amar Rahe" by his supporters. Naidu, who was accompanied by Karnataka Governor Vajubhai Vala and state BJP chief B S Yeddyurappa, sat beside Kumar's mortal remains for a few minutes. The vice president and Kumar shared a good bonding with each other, according to BJP sources. Naidu had worked closely with Kumar during his stint as member of Rajya Sabha from Karnataka and they, on several occasions, have spoken about the cordial relationship. The vice president described Kumar as a colleague from students' movements to Parliament. Vice President M Venkaiah Naidu Tuesday paid his last respects to Union Parliamentary Affairs Minister and senior BJP leader Ananth Kumar in Bengaluru. Naidu flew to the city from Delhi and went straight to the National College ground where he paid homage by placing a wreath on the mortal remains of Kumar. The vice president also consoled Kumar's wife Tejaswini and other family members. According to a resolution passed by the cabinet, from a student activist, Ananth Kumar became a member of the Bharatiya Janata Party. "It was under his stewardship that the party expanded in the state of Karnataka and eventually formed the government of its own," the resolution said. The Cabinet also placed on record its appreciation of Kumar's services to the nation in different capacities and described his death as a loss of an experienced leader. The Union Cabinet Tuesday condoled the demise of union minister Ananth Kumar, saying under his "stewardship" the BJP expanded in Karnataka and eventually formed a government of its own. The special cabinet meeting chaired by Prime Minister Narendra Modi also observed a two-minute silence in the memory of Kumar. According to sources close to the family, Kumar's brother Nanda Kumar will perform the last rites according to Brahmin traditions. Besides Vice-President Venkaiah Naidu and BJP President Amit Shah, Union Ministers, including Rajnath Singh, Piyush Goyal, Harsh Vardhan, Radha Mohan Singh, Ramdas Atavale, Mahesh Sharma, Ashwinikumar Choube and Ramkripal Yadav would pay homage on Tuesday, party sources said. Ananth Kumar's mortal remains will then be shifted to the National College Ground, which falls in his constituency, for the public to pay homage, before the funeral at Chamarajapet crematorium in the afternoon. The central government has announced a state funeral for Kumar. Procession began with supporters chanting slogans "Bharat Mata Ki Jai", "Ananth Kumar Amar Rahe"
The procession began, with supporters chanting slogans "Bharat Mata Ki Jai", "Ananth Kumar Amar Rahe". State BJP President B S Yeddyurappa and party's General Secretary in-charge of Karnataka Muralidhar Rao were present at the state BJP office, where a pall of gloom has descended. Several BJP leaders including Union Minister Sadananada Gowda, R Ashoka, K S Eshwarappa, Anurag Thakur, Pralhad Joshi, and hundreds of party workers paid their last respects to the departed leader at the party office, where the body will be kept for about an hour. A stream of leaders and supporters Tuesday paid their last respects to Union Parliamentary Affairs Minister and senior BJP leader Ananth Kumar, who passed away on Monday. The body was taken from his Basavanagudi residence, where it was kept since Monday morning to Jagannath Bhavan, the BJP state headquarters at Malleshwarm, in a decorated military vehicle with personnel of the three services- the Army, Navy and Air Force- accompanying it. In the 2009 and 2014 Parliament polls, the Congress, sensing a prevalent anti-incumbency mood, made strong efforts to loosen Kumar’s grip over the Bengaluru South Lok Sabha seat by fielding candidates like the youthful Krishna Byregowda and former IT honcho Nandan Nilekani, only to see the BJP leader have the last laugh after forging alliances, behind the scenes, with key leaders of rival parties. The organisational strength of the BJP in south Bengaluru coupled with the capacity of Ananth Kumar, a Brahmin, to strike ground level alliances ensured that the former ABVP leader remained a formidable electoral force despite no major backing from any single caste or community. President Ram Nath Kovind said, “This is a tragic loss to public life in our country and particularly for the people of Karnataka. My condolences to his family, colleagues and countless associates." Vice President M Venkaiah Naidu described Kumar as a “colleague for years together, from students’ movement to Parliament”, and hailed him as a “dedicated statesman”. In his condolence message, Prime Minister Narendra Modi said Kumar worked hard to strengthen the party in Karnataka. “Ananth Kumar Ji was an able administrator, who handled many ministerial portfolios and was a great asset to the BJP organisation. He worked hard to strengthen the Party in Karnataka, particularly in Bengaluru and surrounding areas. He was always accessible to his constituents..I spoke to his wife, Dr. Tejaswini Ji and expressed condolences on the passing away of Shri Ananth Kumar Ji. My thoughts are with his entire family, friends and supporters in this hour of grief and sadness. Om Shanti,” he tweeted. The Union Cabinet will meet Tuesday morning to condole the demise of senior minister Ananth Kumar. A resolution condoling the demise of the Union parliamentary affairs minister and hailing his contribution would be passed. As per established practice, resolutions are passed by the cabinet in the memory of ministers and senior leaders. Similar resolutions were passed following the demise of then Union ministers Gopinath Munde and Anil Madhav Dave. Welcome to our LIVE blog. 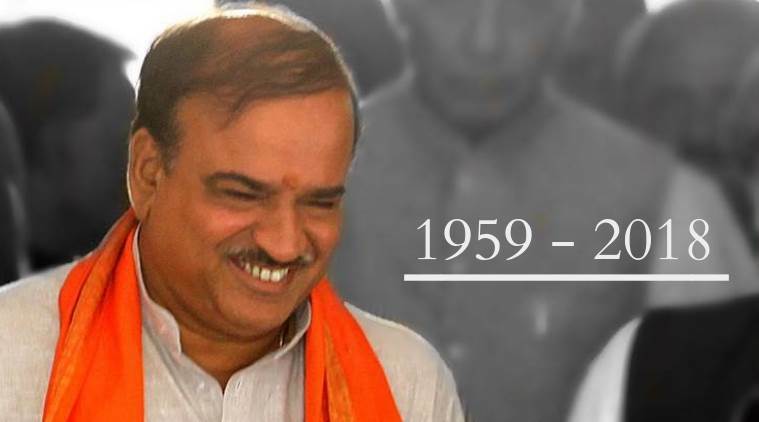 The last rites of Union Parliamentary Affairs Minister and senior BJP leader Ananth Kumar, who passed away Monday, will be performed at Chjamarajapete crematorium in Bengaluru around 1 pm on Tuesday. Follow to get the latest updates. Ananth Kumar served as Union Minister of Chemicals and Fertilizers since May 2014 and Minister for Parliamentary Affairs since July 2016. Ever since he won the seat for the BJP in 1996 for the first time, among the reasons Ananth Kumar never lost even when the BJP fared badly in the rest of Karnataka, was the astute politician’s ability to forge alliances across party lines. He enjoyed a bonhomie with top leaders of all major parties which he put to use during elections, which facilitated his quick rise to the top echelons of the BJP. Kumar served as Union Minister of Chemicals and Fertilizers since May 2014 and Minister for Parliamentary Affairs since July 2016. He represented the Bengaluru South constituency in Lok Sabha. The state BJP said Kumar’s body will be kept at the National College Ground for public to pay their last respects. The rise of the BJP in Karnataka in 2004 — when the party won an unprecedented 80 seats in the state assembly elections — was essentially scripted by Ananth Kumar, and his friend and foe B S Yeddyurappa, through clever ground alliances and strategies.